Many people contact us and ask "What is the best Keys Restaurant?" And our reply is always, along the lines of "This is like saying which one of the fab four was the best Beatle, or which island in the Florida Keys is the greatest!" It all depends on what you want from a Keys Restaurant. By the way, McCartney has to edge Lennon every time! But getting back to the real reason you are reading this, is it a quick snack, grabbed from the side of the road, whilst watching the real Florida Keys occur around, boats bobbing, people laughing, before jumping back in your car and heading down the Overseas Highway with not a care in the world you are looking for? Or perhaps you want the perfect romantic location, to wow your partner; safe in the knowledge that once the bill is paid they are whisking you away for whatever else occurs at the end of a romantic evening. I'll leave it as that....kids might be reading. So we thought long and hard about how to structure all our content on the range of Florida Keys restaurants available to you to dine from, and after realising that it’s so subjective, we have played safe and listed by location. So we will start with providing details on Key Largo Restaurants, and move down the US1 to the list of Keys Restaurants down in Key West. Make sure that when you have tried them out, you come back to the site and leave us a review of your stay, which will help us enormously as we continue to try to make this site the number One resource on the Florida Keys available today. Thanks very much and bon appetite. When you leave the mainland of Florida and start heading out over the water the first island that you will hit is Key Largo. So subsequently, this is the place that you can start to blame for those tightening trousers that have occured since vacationing in the Florida Keys. Many of the restaurants throughout the Florida Keys will have a great range of fishy dishes on the menu. Which isn't a surprise when you are so surrounded by water. But they also will cater from burgers to pastas, from salads to traditional conch cooking. And talking about conch cooking the first place that I would definitely recommend, and which is a bit of classic in the Keys Restaurant stakes is Alabama Jacks. Yeah, I know it doesn't sound the best. But as you are heading to the Florida Keys this is your first opportunity to try some pure Conch dining, in a very realistic environment too. So don't be put off, pull over and give Alabama Jacks a chance. 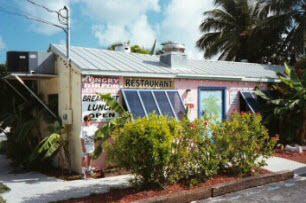 If you don't fancy this Keys Restaurant then simply try either Mrs Macs Kitchen, Senor Frijoles, the Fish House and any of the other restaurants on our guide to Key Largo. You are well on your way through the Florida Keys by the time you get to Islamorada, so your hunger pains should be pretty bad. But don't worry we have more Keys restaurants listed out in order of the Mile Markers for Islamorada. And its quite amazing how many restaurants and diners there are in an area of 7.1 square miles. Starting from Marker 88 which is a favourite eating place of Presidents such as George W Bush, through to Pierres Restaurant where A Listers from the Hollywood scene are often spotted. You can even spend some time feeding the mighty Tarpon fish at Robbies Marina, and watch it leap dramatically out of the water, before wandering across to the Hungry Tarpon restaurant......see what they did there...clever! So read more on our guide to the best keys restaurants in this part of the Florida Keys, and enjoy every single mouthful you get served. The say the way to a mans heart is through his stomach, but it is also true that the way to the heart of the Florida Keys is through Marathon. Known as the "Heart Of The Florida Keys" Marathon has a good range of restaurants and diners, and really has something for everyone. You could start with market and harbor type of experience, where a place like the Keys Fisheries that has been serving up gloriously fresh fish straight from the waters for over 30 years, can literally have you eating over the side of the boat. Whilst others like the extremely popular Stuffed Pig focus more on the huge country breakfasts that our fisherman, locals, and I suppose anyone who loves to start the day on a full stomach literally queue up outside for. The prices in Marathon are considerably less than you will find further down towards Key West, so if you are thinking of stopping as you drive down to the southernmost point then perusing our Keys Restaurant guide for Marathon would be well worth your time. When it comes to dining out, then Key West is really in a league of its own. You can sit and listen to world talented jazz musicians demonstrating their skills, as the finest dishes are brought out to you. Whilst down the road you can have straight off the barbecue steaks and burgers, whilst watching your favourite sports teams go for the kill on big screens. The options are yours, but you will have to aware that the prices of restaurants in Key West, is more in line with large cities such as New York or Washington for example. And that is where people are sometimes shocked, as they have got used to the prices of restaurants and diners that they have used as they made their way through the Keys from island to island. But away from that fact, there are masses of places to go out and enjoy , so we will be doing our best to get as many on to our pages as we can.